UPC-Arena formerly known as Arnold Schwarzenegger-Stadium between (1995-2005) is a football stadium located in the second largest city in Austria, Graz. 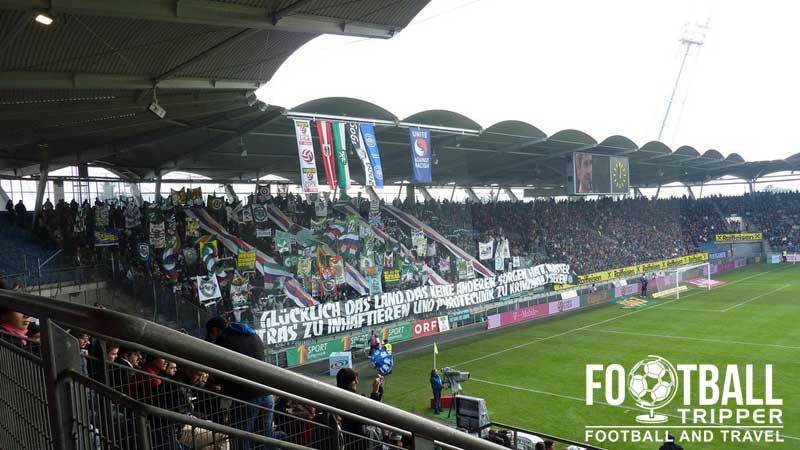 Home to local team SK Sturm Graz who were founded in 1909, the football ground has a capacity of 15,400 – the third largest in the Bundesliga. 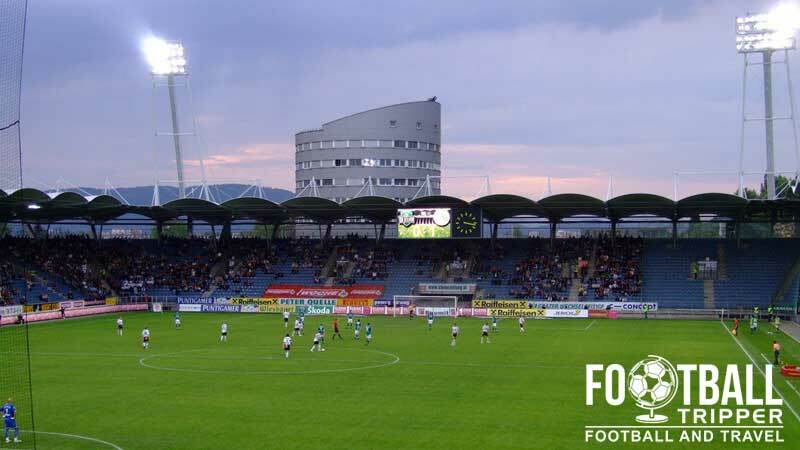 The UPC Arena was constructed over a three year period between 1994 – 1997 after the original facilities known as “Federal Stadion Graz-Liebenau” on the site of the new stadium had became antiquated, having first opened back in June 1951 when the regional Steiermark football federation took on Sunderland AFC. he decision to name the stadium in honour of the locally born Hollywood film star and famous Body-builder proved to be controversial with Schwarzenegger himself actually revoking his use of the naming rights to the stadium in 2005 following public scrutiny of one of his decisions as the Governor of California. Following the Terminator star’s rejection of inmate Stanley Williams’s appeal for clemency from his death sentence, the former gang leader was executed by lethal injection after serving life in prison for chages of first-degree murder. With most European countries not advocating the death penalty unlike some parts of the United States, the decision ignited intense debate in his home town with politicians calling for the removal of his association with the stadium. 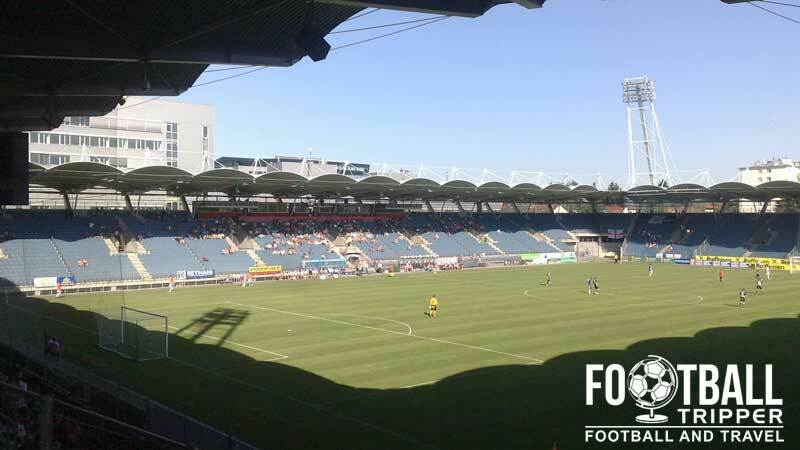 With the stadium nameless, the local stadium operators opened up the naming-rights up to tender and in 2006 agreed a long term term deal with telecommunications company UPC Austria, becoming the UPC Arena. In 2012 plans were revealed to reconstruct parts of the stadium to bring the facilities up to the new FIFA decreed standards in order to host more International matches such as the friendly between England and Japan in the summer of 2010. UPC Arena is comprised of the four stands: North, East, South and West. Away fans are housed within section 23 and 24 within the south stand as shown by the yellow areas in the above seating plan. The fanshop at Stadion Liebenau only opens from 12.00 pm on matchdays however the store in the city centre is open Tuesday to Friday: 9.30 am – 6.00 pm and on Saturdays between 9.30 am to 2.00 pm. The full address of this store is “Girardigasse 1, 8010 Graz,”. Alternatively you could browse official merchandise from SK Strum’s online store. It doesn’t appear as if either SK Sturm or the municipality of Graz currently offers stadium tours of UPC Arena. Tickets to see Sturm Graz can be purchased through the usual channels: Online from the official website, from the club shop during the week, and at the stadium before kick-off on matchdays. Please note that the above prices apply to Category 2 matches, and Category 1 carry a surcharge of anywhere between €2.00 – €4.00. Category 1 games are usually only against Red Bull Salzburg, FK Austria Wien and SK Rapid WIen. 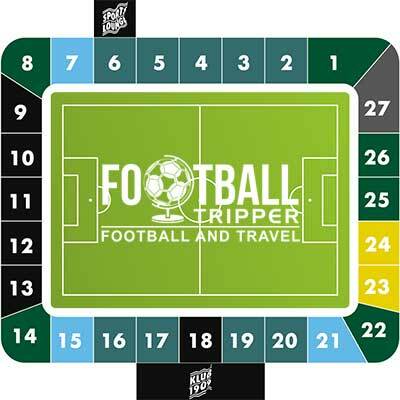 Although the average Football Tripper could certainly walk to the ground in around 35 minutes, it’s much easier to take the tram or overground services. There appears to be parking available 10 minutes south of UPC Arena at the Murpark Shopping Center and station which is known as “Graz Liebenau Murpark”. Graz Railway Station (Hbf) offers an overground service to UPC Arena via the “Graz Ostbahnhof-Messe” stop, however it’s usually for commuters and only departs around once an hour. The closest tram stop is Stadion Liebenau which is accessible via the number 4 pink line. This can be caught from many stops around the city however “Jakominiplatz (Mitte)” is essentially the main terminal. The UPC Arena Tram on its way from the stadium. The city of Graz is served by its own airport which is around 10 km south of the city centre and connected via an overground train service. The closest place to stay to UPC Arena is undoubtedly the Amedia Luxury Hoel although as the name implies it’s not the most wallet friendly option out there. Three mid priced hotels close to the station and centre of Graz are Hotel Ibis, Best Western and Hotel Daniel.